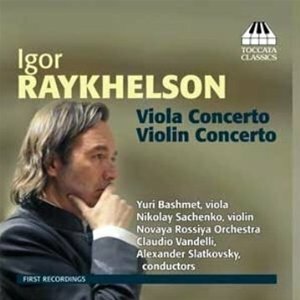 The Modernist era wasn't too kind to the violin concerto, so its easy to understand why Igor Raykhelson takes the last generation of Romantics as a starting point for his work in the genre. Raykhelson's career to date has been divided between Russia and America. It has also been divided between jazz and classical, with the emphasis shifting decisively towards the classical in recent years. Both dichotomies are played out in these concertos. Rachmaninov is a clear model (to the point of quotation in the Viola Concerto), with Raykhelson drawing on his predecessor's success in bridging Russian and American tastes. But the Romanticism is up against competition from Raykhelson's jazz side, with swung rhythms and jazzy chords appearing in the finales of both works. In fact, these concertos, which date from 2007 and 2005 respectively mark an endpoint in the composer's journey from jazz pianist to classical composer, so the jazz only has a nominal presence in what is otherwise a predominantly late Romantic aesthetic. It integrates well enough, but it always feels constrained, with the soloists only occasionally breaking into jazz rhythms and never even contemplating improvisation. Raykhelson looks back to the 1920s and 30s for his 'Classical' sound. The opening of the Violin Concerto sounds like a quotation from the Berg, with a rising and falling figure of open fifths. But if the melody is Bergian, the treatment is very much Rachmaninov. The orchestral textures are expertly voiced, but are always on the thick side. This provides valuable support when heard beneath the soloist's meandering melodic lines, but only those with a very sweet tooth will appreciate the saccharine effect it produces in the tuttis. The concertos are well served by both soloists, and violinist Nikolay Sachenko has nothing to fear from comparison with his more esteemed viola playing colleague. Both give engaged and precise accounts, and both are able to dominate the orchestra without their tone ever sounding forced. They are both able to switch straight into the jazz when required, and Bashmet's louche hotel lobby sound is a particular treat in the finale of the Viola Concerto. The Novaya Rossiya Orchestra presumably draws on years of experience performing Rachmaninov to give these beautifully flowing and expressive performances. There are a few moments of poor ensemble from the strings in the first movement of the Violin Concerto, but otherwise the playing is ideal. The Violin Concerto is a studio recording while the Viola Concerto is taken from a live concert. The difference is only apparent in the acoustic, with the dry studio sound no match for the more conducive resonance of the concert hall. This disc should provide an excellent introduction for anybody seeking to explore the soundworld of Igor Raykhelson. It's a world of unreconstructed and unapologetic Romanticism. Adorno would turn in his grave at the thought of it, but those with a taste for expressive melodic writing may be more sympathetic. And if you're curious about what violin and viola concertos by Rachmaninov might have sounded like, they would probably have sounded something like this.